"...Until the End of the World #2", Mixed Media on Wood, 16"x16"
Gabriel Pons and fellow LibertyTown Artists are participating in a group show to benefit LibertyTown Arts Workshop for the month of May. Below is the Announcement from LibertyTown, celebrating its sixth year this month. Pitch in and support your local art scene and walk home with a masterpiece! The painting I've contributed (above) is the twin of one of my collage pieces I completed earlier this year. "...Until the End of the World #2" is created from old maps, newspapers from around the world and of course a series of stencil patterns I've meticulously been drawing/cutting over the past months (see also the t-shirt design available). “LibertyTown Patrons’ Show:A Show To Benefit LibertyTown"
With the purchase of a ticket ($100) you will be able to select and go home with an artwork* (value ranges from $150 upwards) that is in the Patrons’ Show. Artwork includes 2-D and 3-D work donated by LibertyTown, Local and Regional Artists which will be on exhibit in the Main Gallery of LibertyTown all May. * but not necessarily your first choice…keep reading! As a ticket holder, you are invited to attend the BIG EVENT on May 29th beginning at 7pm, when our emcee for the evening will begin drawing ticket numbers. 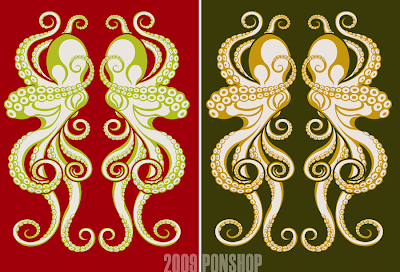 As your number is drawn, you are to select/announce the piece you would like. That means that you may not get your first choice… you may actually be the last ticket drawn… but all work in the show has been selected by a juror to ensure its value and quality. That is why you are encouraged to fill out a “Wish List” of your favorite pieces in the show prior to MAY 29, so that when you come on May 29, you will be ready to select your piece when your number is drawn. In addition, we will also have a raffle all May for the chance to “win” a ticket to the event! Raffle tickets will be on sale in the gallery for $5. All funds will go to the running, growing and prospering of LibertyTown Arts Workshop! We thank you for your continued support! I'm excited to announce that one of my paintings will be part of a group show at the Target Gallery in May. 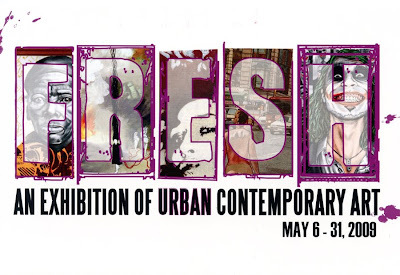 "Fresh" An Exhibition of Urban Contemporary Art will include 29 paintings selected from a national/international pool of artists.